I can remember writing a blog post when Cherry was a toddler about how she had turned into a little daredevil. When I look back now though she was nothing compared to what Tiger is like. The worst she ever did was climb up the sofas, Tiger climbs up EVERYTHING! 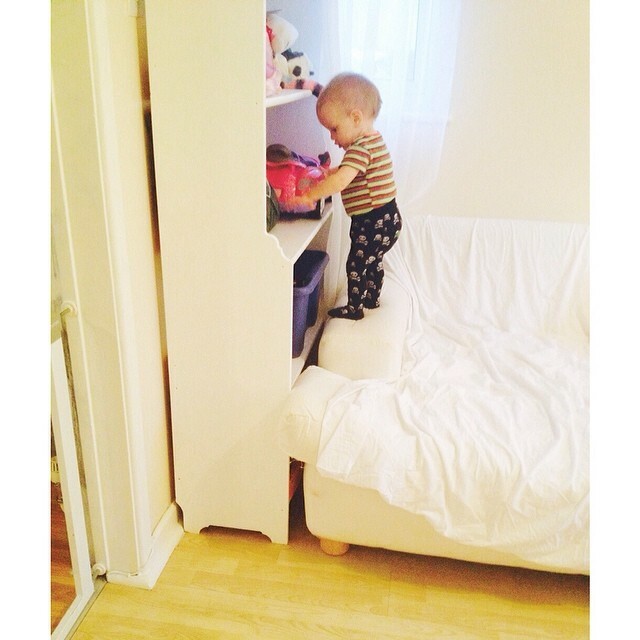 Shelves, window sills, tables, chairs, the boy sure does love climbing. He’s also at that age where he just wants mess with everything but is still lacking the ability to understand me if I tell him something is dangerous so it means I have to keep an eye on him at all times. Put stair gates up everywhere. We currently have one at the top of the stairs, one between our kitchen and living room, one between our living room and hallway and one on the kid’s bedroom. It might sound excessive and I know some people don’t believe in using them but I can’t imagine how I’d have managed over the last few years without them. It means there is somewhere for the kids to be ‘contained’ while I’m cooking or getting ready. The only downside now is that Cherry can open them all so I have to be extra vigilant to make sure Tiger doesn’t end up lose to climb the stairs, or even worse fall down the stairs. Take down any blinds with long cords. Long curtains or blinds with long cords are a strangulation hazard so the kids have short curtains in their bedroom as well as in the living room. Turn down the water heat on the boiler. The water that comes out of some boilers is scolding, I’m sure ours was hot enough to make a cup of tea with so we turned it down so it’s safer. Regularly check your cupboard locks are still working. I’m not sure whether it’s the type we bought or the way they were fitted but we’ve found cupboard locks to be pretty useless, they either break or the catch doesn’t work and the door sometimes opens. Obviously this could be really dangerous if it happens to the cupboard with all the cleaning products / washing powder in so I always check them now. Don’t have any furniture near the windows. I always make sure the kid’s beds aren’t near the window sills as even though we have safety latches I still hate the thought of them climbing up. Keep hair straighteners out of reach. We had a really scary incident when Cherry was a toddler, she picked up my hair straighteners when they were still hot. Luckily she didn’t get burnt but it scared me so much that I’ve not used them since. I just don’t trust myself make sure they are off and put away so I don’t take the chance. Throughout next week Betta Living are going to be sharing lots of content to support child safety week such as ways you can prevent accidents in the home and infographics with lots of useful information. They also have a short survey to fill out, it only takes 2 minutes and you are entered into a prize draw to win £50 worth of Mothercare vouchers. What’s your safety in the house top tip? Post in association with Betta Living.